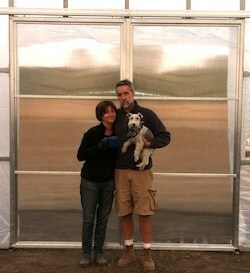 Lisa Jaroch of Cold Frame Farm and her husband in front of their cold frame hoop house. When landscape architect Lisa Jaroch decided to leave her job designing parks and greenways at Hamilton Anderson, a prestigious Detroit architecture firm, she was ready to move in an entirely new direction. A hands-on landscape designer, she had always possessed a green thumb and a passion for sustainability – interests that led her to pursue a new life as an organic farmer. Jaroch left her job in 2011 to pursue certification through Michigan State University’s 9-month Organic Farmer Training Program (OFTP) program at the Student Organic Farm. The 10-acre farm doubles as a hands-on learning laboratory and a local food producer, offering a 48-week CSA, a 7-month campus farm stand, and supplies MSU dining halls with fresh produce. The intensive program educates students on organic farming techniques, farm management and business skills, with a focus on small-scale, diversified organic agriculture enterprises. After a 2-year land search, Jaroch purchased an 11-acre parcel that had been under conventional commodity crop cultivation and launched Cold Frame Farm. The parcel sits just a few miles outside of Romeo, a historic village about 40 miles north of Detroit where Jaroch lives with her husband. The Romeo area, surrounded by conventional agriculture intermixed with suburban development, is known for its apple and peach orchards. Once certified, Cold Frame Farm will be the first organic farm in the Romeo area. Jaroch is pursuing organic certification through the Ohio Ecological Food and Farm Association, and will have to demonstrate three continuous seasons of organic agricultural practices to qualify for organic certification. In order to extend the growing season, Jaroch set up a A 30 x 96 foot high-tunnel cold frame hoop house on the property in the fall of 2012 that was paid for with the assistance of a $6,000 grant from the Natural Resources Conservation Service’s Seasonal High Tunnel Initiative Program. The program offers financial and technical assistance to farmers meeting certain eligibility requirements, including employment of agricultural conservation practices. So far, sales have been brisk according to Jaroch. “We have not discarded any greens,” she says, and customers enjoyed picking up fresh, local produce in the midst of Michigan’s frigid winter. Eventually, Jaroch plans to sell produce primarily from a farm stand, which will be held on the farm property once the Romeo house is sold. Jaroch does not see farmer’s markets as a viable alternative in her area; because of the proximity of local farms, local farmer’s markets tend to have slow traffic. She is considering starting a CSA in the future, but wants to focus on ramping up production in 2013 without the pressure of a subscription service. Two additional hoop houses are planned for the property this spring, and 3 acres will undergo cultivation during the summer months. The rest of the property is planted in a restorative cover crop known as ”green manure” – plant material grown, uprooted and worked into the soil to improve soil fertility. The cover crop includes a mix of rye, red clover and hay vetch. The major challenges for starting up the farm have been mainly financial – start-up costs including land, materials and equipment have been substantial, and the farm is not yet economically viable. Jaroch has been supported by her husband’s electrical contracting business through the transition. In the long-term, Jaroch hopes to incorporate permaculture design into the landscape to heal damage inflicted by conventional agriculture methods over the years. The farm contains an incised drainage ditch that drains to a deep, artesian-fed pond containing pike and bass which spills over into a state-designated trout stream. Jaroch hopes to eventually undertake a stream restoration project using native plants to help heal the landscape. While this year the farm will focus on fruits and vegetables, including mixed greens, strawberries, herbs, and sunflowers, Jaroch hopes to expand into perennial fruits like berries, fruit and nut trees, and asparagus. She also wants to grow and sell cut flowers. “They will add a bit of beauty to the mix,” she says.